Romantic comedies are often the best entertainment you can find. And The Proposal (2009) is proof of that. I mean, you'd never expect romantic comedies to come from real life experiences. Just like you wouldn't walk into an office and be proposed to by a woman you couldn't stand. This is what this movie is all about. A successful editor, Margaret (Sandra Bullock), is on the verge of losing to her job because she is going to be deported. Her unsuspecting assistant, Andrew (Ryan Reynolds), walks in, and Margaret (who is known as the 'witch' at her work-place) decides that they should get married to avoid deportation. Andrew agrees only after being black-mailed by Margaret, who offers him the chance to be a published editor for her business. This at once sounds like a lot of fun, and it is. Right until things start to get quite dramatic and we see the true side of Margaret. The movie chugs along smoothly, with plenty of laughs along the way, but when everything starts to get melodramatic, it loses it's magic. Sandra Bullock does well as a high-flying business-woman, as does Ryan Reynolds, who plays his character with a lot of sarcasm. I love sarcasm in movies. These two are supported by a wonderful cast: Mary Steenburgen (who always plays second fiddle to many actors), Betty White (very delightful and funny old gran), Malin Akerman (okay, she needs to keep going in the direction that Watchmen led her to), and Craig T. Nelson (playing the most dramatic role of the film). 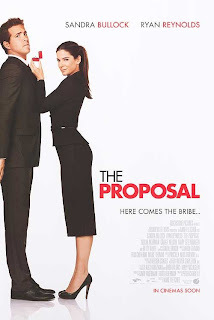 The Proposal is directed by Anne Fletcher, who's last effort was another wedding-themed comedy 27 Dresses. She makes the most of the funny script and the good performances, and manages to produce one of the better romantic comedies of this year. A good holiday flick for all ages, even guys might like it.